My sister texted me a week ago to ask if I’d heard of a new delivery service for groceries called Shipt. Groceries? Delivered to my home? And from Meijer, my favorite grocery store? This sounded fantastic. It took me about two minutes to read the fine print before signing up. I thought online shopping/pickup was a great idea, this sounded like a too good to be true. 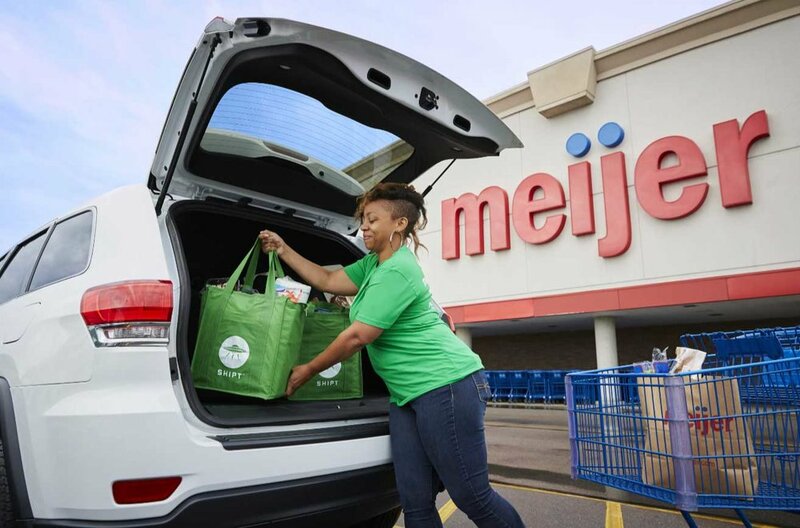 You download the Shipt app or go to the website and see basically everything that Meijer has to offer, organized by category. You can browse as a guest before you commit (more on cost later). When you find the item you want, tap or click it to add it to your cart. You can easily change quantities or add notes to your selection. For example, if you like your bananas Kermit-green, you can make that request. If there is an item you can’t find but you know Meijer carries, you can tap “special request” and describe what you want. Much of what is listed is food and we needed light bulbs, so I made a special request with the brand, wattage, type, etc. When finished, you are taken to a screen to schedule your delivery. They advertise that you can have groceries delivered in an hour. But that really depends on whether or not someone is working that hour because they use an Uber-like model of independent staffing. Since this service is relatively new in our area, there were workers but weekend time slots fill up really fast. I placed my order on a Friday at about 8 p.m. and it was delivered on Saturday morning at 9 a.m. I could have had it delivered on Friday at 11 p.m. but that was past my bedtime. In the future, I will remember to schedule it a couple of days ahead if I need a specific delivery time. When I scheduled delivery, the top bar told me that Shelli had been assigned my order. However, that name magically changed to Dian while I slept. After I placed the order, I was still able to make last-minute additions which is great because ordering cereal without milk is pretty much pointless. In fact, the next day when Dian arrived at the store, she texted me to ask if there was anything that I forgot to put on the list. I’m assuming this was an auto-generated text but nice none the less. In the settings, you can specify the amount of control you want the shopper to have over your selections. If they are out of Cheez-its, will Cheese Nibs do? In my opinion, of course not; but you may care less. You can either specify “no substitutions” or allow the shopper to use his/her best judgement. I found even when I specified no substitutions, I got a quick text message asking for direction when the quantity of an item I wanted wasn’t available but a smaller package was. Dian also texted me when she had checked out and was about to leave the store so that I knew when she would arrive. Ten minutes later, during the worst thunderstorm we’ve had this year, Dian arrived. I was upstairs occupying the dog during the transaction but my mister commented she was friendly and organized. She asked how we liked the app and offered to carry all the groceries to the kitchen. Given the amount of water falling from the sky, they decided it was best to just place all the groceries inside the door. Before she pulled out of the driveway, I got a notification on the app that my food was delivered (obviously), asked me to give the driver a star rating, and let me specify a tip. Well, she certainly deserved five stars. As for tipping…I've never used a service like this before and I looked over the Internet to see what other people tip but really didn’t find much crowd chatter. I eventually decided on approximately a dollar per bag like a bell hop. My order was about $100. And there were seven bags. I gave her $10 simply because it was such an awful thunderstorm and I remained indulgently dry. Our normal grocery trip takes up a Sunday morning and since that chore was already done, we went downtown for brunch at a Taste of Belgium and then walked around the Banks in Cincinnati. It was a peaceful, lovely, chore-free morning. The next weekend I placed a similar yet smaller order for groceries but this time on a Friday night. I received a text when Christina got to the store. But I never heard from her again. No texts, and no groceries. As far as the app was concerned she was still shopping 12 hours later. Eerie. The next morning I contacted Shipt customer support via chat to let them know that I had an open order that was never delivered. Joshua was prompt and removed the order from my account, released the charge on my credit card, and gave me a $20 credit on my next order to apologize. I replaced my order about 15 minutes later and it was completed by Laura several hours later with the same five star service that Dian provided. So, I’m not sure what happened with Christina but I hope she is okay. Shipt is a convenience service, and not a cheap one. If you are into coupons (you can't use them) and frugality in general, Shipt is not for you. You pay a subscription fee either monthly ($14) or yearly ($100) to receive unlimited deliveries. They also mark up each item a bit. Most items I didn’t really notice. Others I did. Bananas are $.29 each. That seems high. Each order must cost at least $35. Eh, you really can’t walk out of the grocery without spending $35 anyway unless you have like jujitsu mind control. Oh, and don’t forget to factor in the tip. I read online that many customers don’t tip but that seems super rude, people. It crossed my mind that not actually going to the store myself will cause less impulse shopping. Only time will tell for me if that balances out cost-wise. I have a hunch it will though. Also, I think eating healthier will be easier with produce delivery. I like Shipt. It unclogs my Sundays and brings less I-should-have-ate-before-coming-here purchases into the house. My mister likes it too but has confessed a bit of a guilt complex. "Why purchase something I can do myself?" he asked. I, however, see it as a luxury of outsourcing something I dislike to someone who wants a flexible way to earn extra cash. Especially since I work very near several colleges, I can really see this as a great job for that age range or anyone really who wants to earn extra. Save $10 when you sign up for Shipt via this link.